Genesis Housing Association and Queens Park Rangers FC have appointed Galliford Try Partnerships to deliver the first phase of construction works at Oaklands – the first development being brought forward at Old Oak Common. 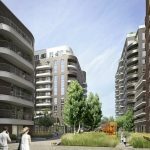 The £155m contract will be undertaken over a 164-week construction programme, and aims to be the catalyst project of the UK’s largest regeneration scheme. Works comprise the demolition of derelict buildings to make way for a 605 home development, of which 40% will be social and affordable homes. The development also incudes 3500 sqm of commercial space. Genesis and QPR’s new residential-led development will, it is hoped, make a major contribution to delivering the Old Oak and Park Royal Development Corporation’s (OPDC) overarching vision for this area of London.